My Grandma Norma Harriman used to say "there's Gypsy blood in our family," and the deeper through life I go, the more I believe her. 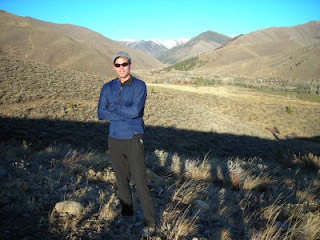 Last week found me in Sun Valley, Idaho, a magical place where our extended family has often gathered. I'm now fortunate enough to regularly visit Sun Valley/Ketchum for business...and of course always mix in a little recreation along with it. There's not a better recreation town on the planet. 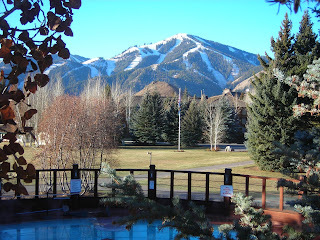 This photo (taken from a deck at the Sun Valley Inn) shows iconic Bald Mountain, which will soon be blanketed with skiers. With luck, you may even run into Arnold or Demi. Joanne accompanied me, and we both pursued our separate work projects for a couple of days. With the short daylight hours of mid-November, we didn't have time for much other than work and dinner, but did manage a quick sunset-hour hike. We scurried up the new Gun Club trails above Saddle hill, and this photo shows the view from there looking up Trail Creek. Some of the best fishing memories of my life have been in that creek, dating back to the simple days before I could even ride a bike. It's also home to my brother Mark's infamous wolverine encounter...which I witnessed. But it's late, and that's another story. From Sun Valley, we followed our Gypsy genes over to Boise and more business meetings. I found a new product supplier for R.U. Outside who actually makes items in the USA!! I'm all about supporting that, very excited, so stay tuned for the product introductions next fall. Joanne had some good real estate-related meetings, plus we connected with an old high school friend who now lives in Boise. 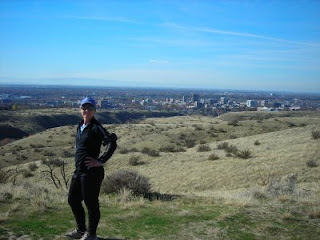 Then, at last, we bolted for a mind-clearing trail run in the Boise foothills. Pretty cool to be at the state capitol building one minute, and galloping along sweet singletrack the next. Yet another reason why we love Idaho. 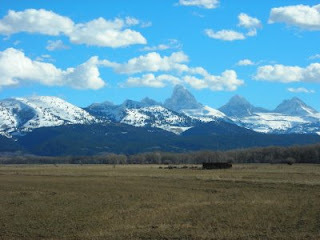 Our quick Tour-de-Idaho concluded with a pleasant drive back to Driggs. Driving on bare roads this late in the year is a bonus that I don't take for granted (too many trips in blizzards over the years). But, the drawback is no snow to play in yet. Grand Targhee always tries to open before Thanksgiving, but it's shaping up to be pretty lean pickings with only a 21" base as of today. They're scheduled to open this weekend, but bring your rock boards. Of course, we never miss a winter in these parts, so check back soon for a snow update.